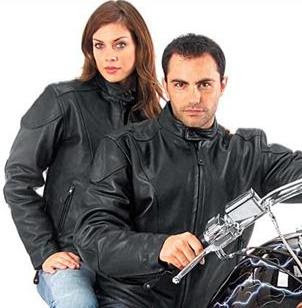 A leather motorcycle jacket is the perfect choice for riding your motorcycle. It's also a long term investment so you should know about caring for your leather motorcycle jackets. Leather is durable and designed to last a long time with very little effort. Here are some tips to keep that jacket looking great. How much actual care your jacket will need will depend on how much abuse your jacket takes. How much time it is in the hot sun or how much rain you expose it to will play a role in how much conditioning you'll need to give your leather. If your leather starts to look and feel dry it's time to condition it. Rain is really hard on leather because it pulls the moisture out of the skin. It's actually a good idea to condition your jacket every time you wear it in the rain. There are two schools of thought for conditioning your jacket. Many prefer mink oil is a good choice. It waterproofs it by clogging the pores similar to the way Vaseline would. Eventually it will dry out the leather and it may even leave a whitish haze when it solidifies in the colder weather. You can also use a Lexol type leather conditioner for your jacket. If you don't treat your jacket and protect it from UV rays it will fade over time. Black leather is really susceptible to fading. Use a product like Aerospace Protectant to prevent fading. These products also condition the leather. It's rather like a sunscreen for your leather jacket. 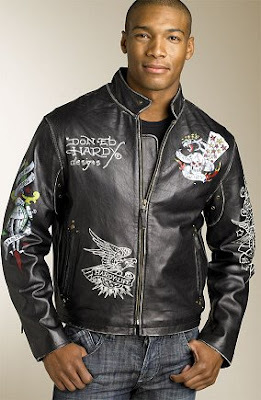 Besides treating your leather jacket you should wipe it down with a damp cloth regularly. This will remove any surface dirt. When you are storing it you need to make sure that there is room all around it so it can breathe otherwise it may dry out. Whenever you are using any of these cleaners or protectants you need to make sure the room is properly vented. Never use hair gels or sprays or colognes or perfumes near your jacket. In fact avoid the use of any sprays near it. If your coat gets wet while you are out then hang to dry where it can breathe but not directly near any heat. If your jacket develops a wrinkle just use a towel and your iron to remove it. If you haven't yet purchased your jacket look for the best grade of leather you can afford. Always choose a full grain leather and settle for nothing less. It doesn't have to break the bank if you shop online. Leather motorcycle jackets are as easy as any other leather product to care for and with a little TLC they'll last forever. What a great investment! buy viagra i notice a great difference in him. Nice information provided here which is very useful to everyone...I am not a huge fan of this side, there do seem to be a lot these days...thanks for posting...Let me know more about this one..
Nice and amazing post. Keep it up. soo good page... thanks admin. Thanks for your sharing about how to keep fashion. Hi! That is a nice suggestion about biker leather jackets care. That is what I'm looking for. This tip is very nice to keep fashion. I totally agree with you that it is very good to follow your guidelines. Those tips seem to be good. I will give it a try. wow! so impressive. these biker leather jackets are really useful! look so cute! very Nice leather Jackets. that will protect drivers very well, i bet that! wow! so impressive. These leather jackets biker is really useful! looks so cute! Pretty good post. I bookmarked your post for later reference. Loved the pictures. Keep it up! Very Nice. I wish I can do all of that in a short period of time. But for persuaded doing those will generate results. I will try to spread your words from first to last my blog and link it back to you. Thanks a lot for those tips. This post is great. Very informative and useful. Thanks very much! This post is great. Very informative and useful. This post is very intersting. Thank a lot. hey man This post is very intersting. Thank a lot. very nice jacket...these jacket look so cute for drivers! Perfect! Very nice jackets! The first one is so Ghost Rider! Very good site. I like it. Thank you. Florida Transportation Services offers airport shuttle service, Orlando airport transportation, Sanford airport shuttle and Port Canaveral cruise transportation. Your posting is very good. Thanks a lot!! nice jacket, i would buy myself one this winter. Impressive load of work. Keep it up. Will definitely come back. Interesting site you have here. And it would be nice to see what you to say about macro trading. Most experts on this subject have an annoying have of taking a simple concept and twisting and turning around it until it sounds hellishly complex. Advocacy efforts over the prospect of credit card interchange regulation have led to a gridlocked debate between retailers and credit card companies. Interchange fees are the cost stores pay to banks when customers use credit cards. Consumers who do not use credit cards may be paying higher prices for goods and services, as merchants pass on their increasing card-acceptance costs to all of their customers. Proposals for reducing interchange fees...would benefit [merchants]. Consumers would also benefit if merchants reduced prices for goods and services, but identifying such savings would be difficult. Some consumers have benefited from competition in the credit card market, as cards often have no annual fees, lower interest rates than they did years ago, and greater rewards. I might face higher card use costs if issuers raised other fees or interest rates to compensate for lost interchange fee income. Welcome to the piecepack wiki! The piecepack is to board games what a standard deck of cards is to card games. I wanted to write a quick comment in order to say thanks to you for these amazing strategies you are giving out on this website. My prolonged internet research has at the end of the day been paid with beneficial content to exchange with my best friends. I 'd say that many of us readers are very lucky to exist in a decent website with many outstanding professionals with great methods. I feel very much happy to have come across your entire website and look forward to really more entertaining moments reading here. Thanks once again for all the details. This is a great and informative post.Well, the points given were facts that could never go wrong. I have visited so many pages with the same discussion and topics. Lovely blog for me. I always search for these type of topics and I would like to read a bit more about this topic. Thanks for posting the nice information.